Time for New Pool Rules . . . in Autumn? It may still be in the 80s and 90s outside, but by now most pools are closed till next year. Oddly enough, however, this an ideal time for property managers and boards to revisit their community’s pool rules. Think about it—in the weeks leading up to that big Memorial Day party, is the board really going to remember the specific rules it wished were in place last year? Probably not. It is not common to find specific pool rules in a community association’s declaration or bylaws. This is because the pool is generally located on the association’s property or the common elements. As such, the board most likely has unilateral authority to adopt rules governing the use of the pool and/or the community’s other amenity areas. It logically follows that the rules can also be changed from time to time as the board sees fit (i.e. without a membership vote). This means, compared to the declaration and bylaws, rules and regulations-such as the ones governing the pool-should be the most amorphous of all the community’s governing documents. In addition, they are meant to provide additional support or explanation of the other restrictions already in place (e.g., on nuisance). This implies that the board cannot create any rule or regulation that conflicts with the declaration. For example, if the declaration allows the board to adopt rules and regulations governing the use of the common areas, the board can easily tailor pool rules as the community trends change over time (e.g., policies on pool supervision, food and drink, etc.). Do the pool rules conflict with the Fair Housing Act (“FHA”)? Age limits on children using the pool unattended. The FHA does allow for age limitations on certain activities if the limitation is reasonably related to the health, safety, or welfare of the child. Many community associations attempt to provide that no child under the age of eighteen can be at the pool unattended. However, this type of age restriction has been found to be discriminatory under the FHA. Based on cases and HUD advisory opinions, an association’s maximum age limitation should probably thirteen years of age or less. Swim Diapers. Another common rule is to require children three and under to wear swim diapers. This has also been found to be discriminatory as it singles out certain children. The better option is to simply state that all non-toilet trained or incontinent individuals should wear swim diapers while in the pool. Improper: Children shall not bring skates or bikes into the pool. Proper: Skates and bikes are prohibited within the pool. Thinking back on which pool rules worked and which ones did not, remember to focus on the behavior, item, or thing that caused the issue-not the “who” in the equation. 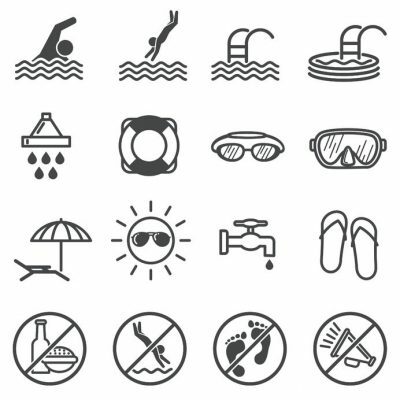 This is the key to having effective pool rules that avoid potential liability. When in doubt, it is always a good idea to have the association’s attorney review the pool rules, especially since FHA violations can result in significant fines to an association. It is always better to be safe than sorry!